Could you please send us a screenshot of the complete error message you are seeing. Could you please download and install our latest hotfix GPG Suite and see if that solves your problem. Kindly find attached two screenshots: one of the error message, and one that shows’s my GPG is up to date. 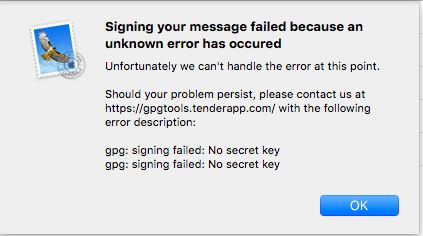 Do let me know if I’ve missed anything - I tried again and it’s not letting me send emails, no matter if I turn on/off digital signing and encryptions…. Please find the screenshot attached. Could you please send a debug log from your affected machine: Open System Preferences > GPG Suite > Send Report. Check the box to "attach debug log". Since you already described your issue in this discussion, you don't need to add a lot of detail, but please do add the link to your existing discussion, so I can then merge your debug info with this existing discussion. Steve closed this discussion on 05 Sep, 2018 04:02 PM.